« What to do if I forgot my password and/or username? How to use Zotero and Docear at the same time? If you want to use Zotero together with Docear you need to export a BibTeX file, each time you change or add an entry in Zotero. This process can be done automatically with the Zotero plugins “AutoZotBib” and “Zotero Autoexport“. Export Zotero’s references as shown on the screenshot to a BibTeX file. 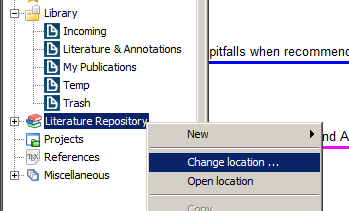 Save the BibTeX file in a location that will be part of your Docear project home, e.g. c:\university\zotero.bib. Select your Zotero BibTeX file in Docear (right mouse click on “References”). After selecting the BibTeX file, you need to tell Docear where Zotero saves your PDF files. To have a better overview in Docear we would recommend making the following setting (Monitoring – Settings – Flatten directories), but this is optional. There are many more add-ons for Zotero that facilitate BibTeX export etc. For an excellent overview, read here.